I wanted to wait unit it rained so I could see how well the Gutter Topper worked. I had to wait awhile. When it did rain I couldn't see any water coming down on the outside of the gutter like is has before. It is just nice not to have to worry about cleaning the gutters anymore or worrying about the dragging the ladders out and not falling off it. A few days ago, the Maple trees were shedding their seeds, the little helicopter seed, as we call them. I told my husband we don't have to worry about cleaning those out of the gutters this fall! 1. Provider called when there was a scheduling conflict and we easily set another time. 2. Providers installer installed the first 192 feet of Leaf Terminator. Did the entire job in 1 Day. Removed old gutter brushes, cleaned and caulked gutters where needed. Neatly gathered the old gutter brushes and pick up all metal scraps. 3. Provider did the 12/16 install and again everything was superior including caulking corners of existing gutters. Highly recommend Nick Budreau (Owner of Gutter Topper of KC) for any gutter covering needs. 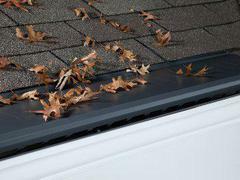 Description Of Work: "Leaf Terminator" gutter cover product installed on several gutters. We were so pleased with the gutter toppers installed last November, we had Nick and his crew come back to do a few areas that we hadn't done last fall. Again, his ease to work with made it a pleasure to do business with him. Description Of Work: They repaired and replaced an outdated gutter guard system. Member Comments: They built custom pans to stop water overflow from our roof in certain areas. we have large pitched roofs. we had a 3 inch ran after they completed and did not have that issue at all. would strongly recommend them, their crew was polite and courteous. 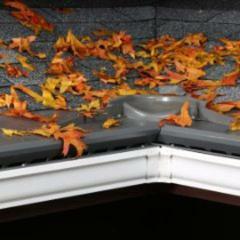 The Gutter Topper was one of the best home improvements that we have made to our home. Our home has a walkout basement so the back of the house requires a 40' extension ladder to reach the roof. Every year during the spring rains the water would overflow out of the gutters and down the side of the house. This was due to the debris in the gutters from the mature trees that overhung the roof. Each spring we would have to hire someone with an extension ladder to clean out the gutters. NO MORE! 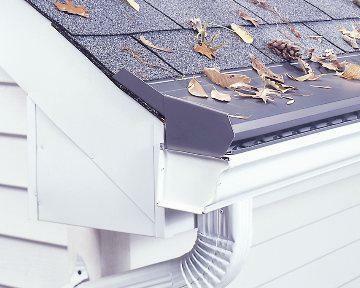 We called several gutter "cover" companies and had them quote on installing a system that would keep out the debris and still allow the rain to flow through the gutter as it should. The Gutter Topper system that was installed has performed flawlessly! It is a simple system and works especially well if you have wood shingles on your home like we do. They were installed in an afternoon and "no cutting" or alerations were done to existing roof! 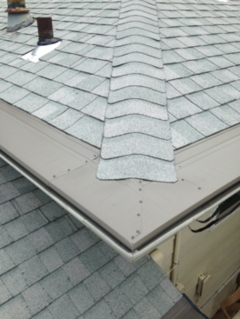 Upon completion of the installation, they completely tested the system to make sure that they worked and even did a minor repair on the gutter "fre" where the roofers had improperly re-installed th gutters after they had roofed the house. A special side comment is that their salesman directed us to the cheaper product since we had the wood shingles, instead of the deluxe system that they offer!